While no food or diet can promise 100% protection from breast cancer, research suggests that what you eat can impact your breast cancer risk. That's because some foods have the amazing ability to heal and protect your body from disease. The latest breast cancer-fighting food on the block is the humble tomato, thanks to its ability to elevate levels of a hormone known to help regulate fat and blood sugar. This is according to a study published in the Journal of Clinical Endocrinology & Metabolism. Keep reading for the full findings. 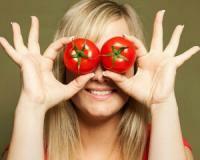 The study looked at women who ate diets rich in tomatoes. It found that those who ate at least 25 mg of lycopene – the bright red carotene and carotenoid pigment found in tomatoes – daily for 10 weeks saw a healthy rise in adiponectin, a hormone involved with fat and blood sugar levels. On average, levels rose 9%. Interestingly, a diet high in soy lowered the levels of the fat-fighting, sugar-stabilising hormone. The study explains that as a postmenopausal woman ages, her body mass index tends to climb – a clear breast cancer risk factor. It found that a diet high in tomatoes helps promote better fat regulation and sugar metabolism, keeping women’s body mass index out of the red zone. “The advantages of eating plenty of tomatoes and tomato-based products, even for a short period, were clearly evident in our findings,” said study author Adana Llanos, PhD, MPH, assistant professor of epidemiology at Rutgers University in the United States. “Eating fruits and vegetables, which are rich in essential nutrients, vitamins, minerals and phytochemicals such as lycopene, conveys significant benefits. Based on this data, we believe regular consumption of at least the daily recommended servings of fruits and vegetables would promote breast cancer prevention in an at-risk population,” added Llanos. Always opt for organic tomatoes. Non-organic tomatoes may contain known or probably carcinogens and hormone-disrupting chemicals. Ditch canned tomatoes for fresh ones. Most cans are lined with bisphenol A, a hormone-disrupting chemical associated with breast cancer. Grow tomatoes at home if you have a garden. Heirloom tomato varieties are a great choice – they’re easy to grow and are super-tasty! Who would’ve thought that this humble fruit has such powerful breast cancer-fighting properties?